This mortgage calculator and property finance analysis software helps you to get answers on a lot of topics around home financing, loans, credits and financing. The following paragraphs describe and explain each view or tool of the mortgage calculator software in detail. 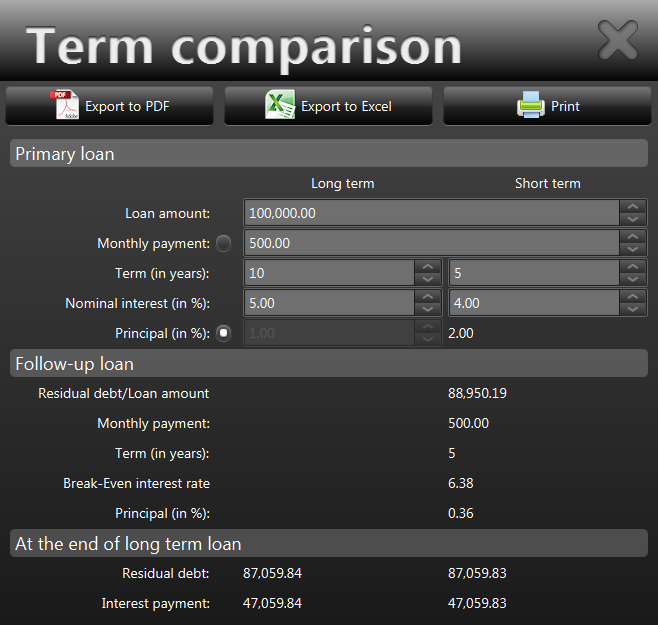 This view is the main view of the mortgage calculator. It gives you an overview on your finance scheme that you have planned and created for your property purchase. It may consist in the easiest case of only one loan as well as the combination of an arbitrary number of loans loans. Each loan is represented by a loan bar that shows the most important details of that particular loan. A follow-up loan is displayed as an indented bar right below the loan that it follows. Possible loan types are either annuity loans or full repayment loans (loans that have a rate which leads to a full repayment by the end of the term). Both have fixed interest rates during the term. The finance scheme can be printed and exported to PDF or Excel to further process it there if necessary. 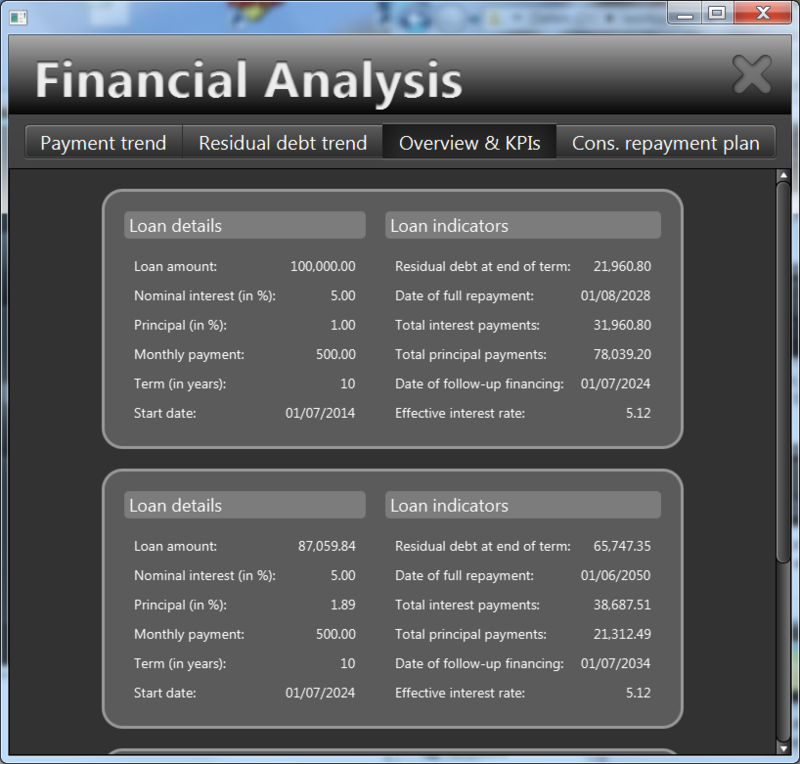 The third button shows the repayment plan of the loan. The fourth button with the blue right arrow creates a follow-up loan from the current loan. The details of the follow up loan are derived from the current loan. The red button on the right end of the bar deletes the current loan. All values are immediately changed in the underlying loan. This form is also a loan calculator, where you can calculate one of the following values: amount, interest, principal or monthly paymentfrom the other three. You can determine the value that you want to be calculated by ticking the according radio button left to its input field. After that this value cannot be edited anymore and is automatically calculated, when one of the other three is changed. The principal and the periodic payment will be calculated from the other values by clicking on the button Calculate payment. In this dialogue you can enter extra payments. It is allowed to enter arbitrary extra payments (although loan conditions might allow only for a certain number of extra payments, e.g. one extra payment per year). The extra payments are calculated on the exact date, that you enter here. You can duplicate an extra payment by clicking on it and pressing the Duplicate button. 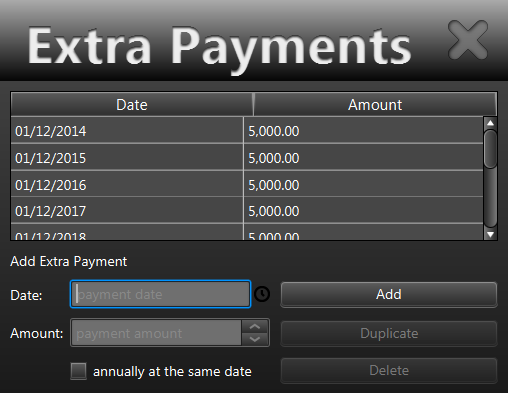 The duplicated extra payment automatically has a date that is exactly one year after the marked extra payment. If you check the checkbox annually at the same date, BaufiFX automatically fills in extra payments until the end of the term. 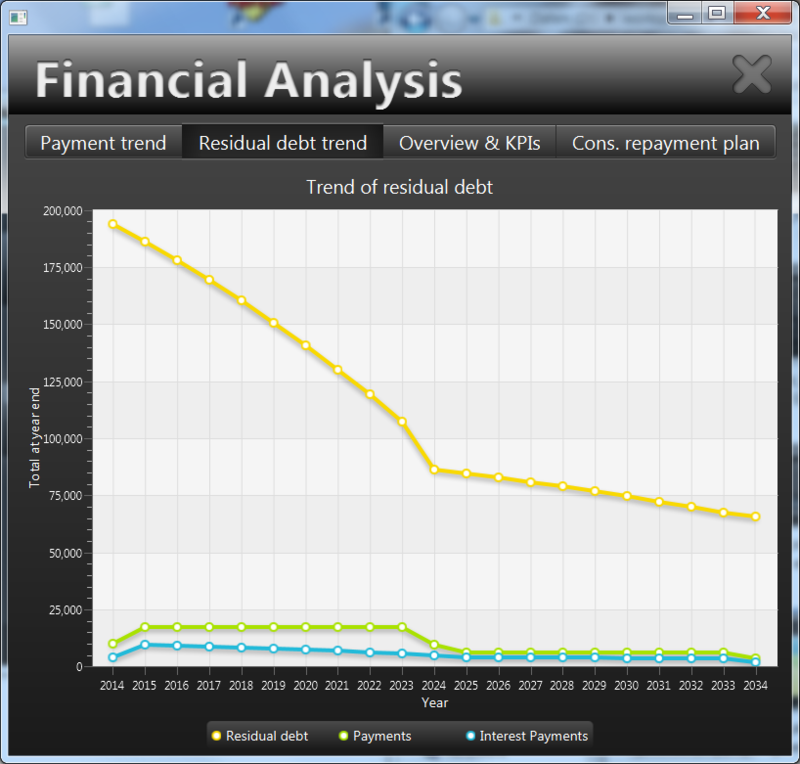 This tool allows you to calculate the repayment plan of a single loan (either annuity or full repayment). The repayment plan also takes all extra payments into account that were entered in the extra payment editor. Note: The calculation of the interest and principal is always for the first of the month. This is not changeable and might be different in your loan conditions. The first rate is always one month after the start date of the loan (payout day). 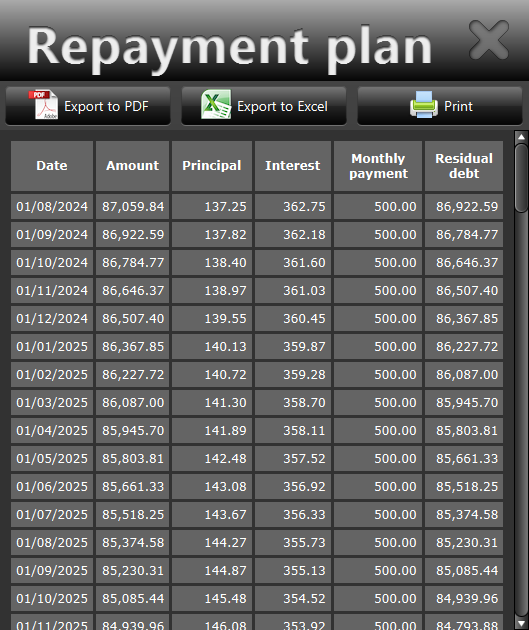 The repayment plan can be exported to PDF or Excel and printed. This chart shows the total payments per year divided into interest, principal and extra payments. It takes all loans of the finance scheme into account. This chart shows the trend of your residual debt. Again all loans of your financing scheme are taken into account here. 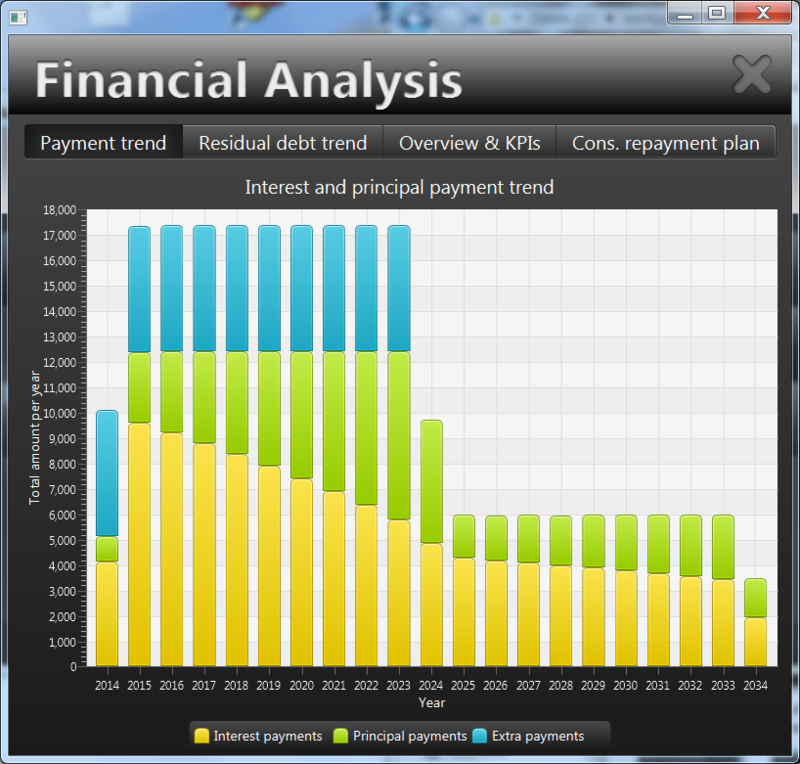 Two additional lines in this trend chart show the trend of the payments and the interest payments. 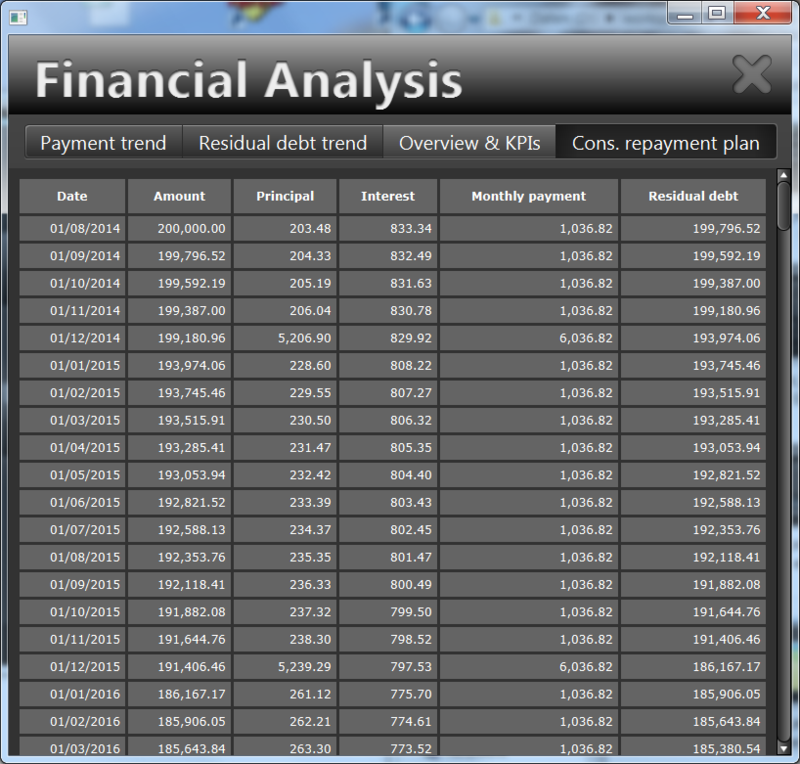 This overview shows the detailed data of all loans in your finance scheme in the order that you created in the main view. The date of full repayment of this loan. 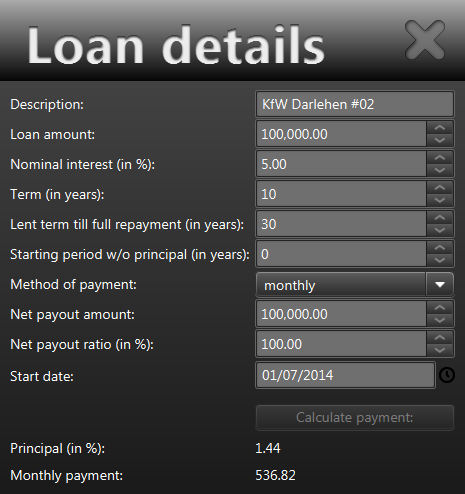 This calculation simulates a (theoretical) prolongation of the loan beyond the end of the term with the same parameters until the loan is fully paid back. The total interest cost of this loan during the term. This indicator basically tells you what you pay the bank in total to get this loan. The total principal amount during the term. This indicator tells you how much of the original loan amount you will have paid back to the bank by the end of the term. The exact date when the term ends. On this date you either have to pay the full residual debt (see above) to the bank or get a follow-up loan with an amount that equals the residual debt. This tool calculates the repayment plan of each single loan and combines the result to a single consolidated repayment plan. It gives you a complete list what you pay and where you are at each moment in time during your complete repayment phase. Loans with fixed interest rates are offered with different terms (e.g. 5, 10 or 15 years, etc.). The longer the term is, the higher the fixed interest rate will be, because a longer term means that you will have a longer time security against interest changes in the market. This calculator allows you to compare loans with different terms and fixed interest rates but similar conditions otherwise and to decide which will be the better choice for you under certain conditions. Interest and principal of the follow-up loan are calculated in that way, that they lead to the same residual debt like the long runner. The important value in this calculation is the interest rate of the follow-up loan, the so called break-even interest rate. If you expect to get a lower interest rate for your follow-up loan in the future than the break-even interest rate, then you would be better of with the short runner. If you expect the interest rates to raise over the break-even interest rate in the future, you will be better off with the long runner.